En regnvåd søndag kan vel ikke bruges bedre end til blogging og scrapping. Her er et kort som jeg har lavet til en fødselsdag for et stykke tid siden. Det er bare ikke blogget endnu, det forsvandt vel i julekortene. Stemplet fra Penny Black er nyt og hedder 'A Great Surprice'. Mønsterpapiret er fra 'Jillibean' og passer godt til et maskulint kort. blev ikke helt knivskarpt som jeg bedst kan li'. B for Baubles, a DT card for ABC Christmas Challenge. It's Wednesday and time for a new challenge at ABC Christmas Challenge. 'Have A Ball', the papers are from LOTV. The image is coloured with my Prismas. The 'Happy Christmas' sentiment is from Stampin' Up. my personal stamp masked together with a part of the image. For my card I've used this sketch from Sketch Saturday. 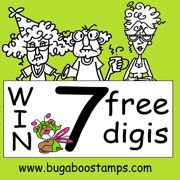 Sponsor for the B challenge is Bugaboo Stamps. Offering One lucky Random winner 7 digi images of their choice. I hope that you will be joining in on the fun with your own gorgeous Christmas creations. Be sure to stop by the blog for some more wonderful DT inspiration. Cute Card Thursday- # 408 A Bit of Fun! But remember, ALL challenges have the alternate option of *ANYTHING GOES* too! 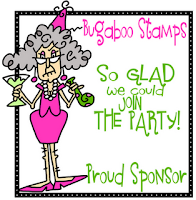 stamps, CD images or decoupage by House-Mouse Designs. and here you see my first card using a motive from the pad. but I found the motive really BIG! in the rain, there was no room for much embellishments! design team has come up with at House Mouse & Friends Monday Challenge. A Mid Way reminder for HMFMC, Winter Fun! We are still having WINTER FUN! at House Mouse & Friends Monday Challenge. Inspired by Pauline I've made a CAS card with an image called 'Hang on tight'. I love the colours and pattern on that line. scalloped border I've used a new Spellbinder edge die. Simon Says Stamp has been in business since 2002, offering you the best selection of Rubber Stamps, Altered Art, Scrapbooking, Artist Trading Cards and Paper Crafting Supplies in the world. With such an amazing variety and awesome deals on shipping, it’s always good timing to shop at the fabulous Simon Says Stamp store! A is for Anything Goes, a DT card for ABC Christmas Challenge. Hi and welcome to the first letter at ABC Christmas Challenge. digi images to play with,thanks to Sami Stamps for your kindness! My image is called 'Frosty Star', you can find it here. new design papers from Maja Design. can you se all the snowflakes? A close up at the image, there's stickles added onto the red stars. The sentiment is a border at the dp. ofering a 12$ gift card to the shop at www.samistamp.blogspot.com. Thank you for popping in today, don't forget to take a look at the ABC Christmas Challenge to check out the fabulous DT inspiration and join in with the Anyting Goes challenge. Winter Sports/Winter Fun, a DT card for HMFMC. Hi and Happy New Year to all House Mouse lovers. The theme is chosen by lucky me, I'm the host for this challenge. as theme for the next two weeks. stamped/decoupage or from a CD rom. 'Holly Sailing' image featuring Monica and Mudpie having a lot of fun. I'v added some stickles onto the snow and Glossy Accent on to the berries. It's hard to se, but it's there. Proudly Sponsored by Heidi and Simon Says Stamp!! What a fabulous Prize, heh? Be sure to enter for your chance to win! at House Mouse and Friends Monday Challenge.